A company, understood as a collaboration between people and means, derives its existential right from the fact that it is able to organise cooperation faster, better and more cheaply than the market. If it is unable to do this, then a company does not have a competitive offer. In the piranha economy in which we are increasingly finding ourselves, the transparency of the Internet is enabling larger and larger parts of the market to quickly and firmly draw conclusions about a company to this effect. At the same time, the Internet dramatically reduces social transaction costs and costs related to arranging cooperation. Consequently, companies are compelled to reduce internal transaction costs and, to a greater extent than even five years ago, to compare themselves with the market outside. If a company does not take this initiative, its customers will, if only because customers are turning more and more to the Internet to aid their purchase decisions. Within companies this does not only lead to an increased interest in “best practice” studies and Business Balanced Score Card approaches, but also forms a compelling reason to face the question as to what defines their core business: where do they have a competitive offer and thus a future, and where do they not? In brief, where is the “inside” approach at least as good as the “outside” alternative? In this way, our piranha economy forces businesses to restrict themselves to activity in which they are able to rank themselves at least an “A” or an “A+” – an “A-” on the report is good, but not good enough if the market has an “A” on offer! In the present Dutch economy, approximately 80% of coordination costs are transaction costs related to finding, creating and delivering information. Unsurprisingly, herein lies a major catalyst for change in the market and in common business practise. What does this mean? To make the most of the opportunities the Internet offers, a company must search for its own “A”s and “A+”s. At the same time, business activities unable to stand the test of the market should be left to other excelling companies by means of outsourcing, offshoring and business partnering. Successful business communities consist of different companies which are all at the top of the bill in what they are able to specifically contribute: these emerging symptoms go hand in hand with dynamic unbundling and the creation of new cooperation patterns (now, a few years later, we refer to this phenomenon as ‘co-creation’). In years to come, individual companies will be evaluated according to their ability to organize the price:performance ratio across other companies in their community. In other words, companies will be expected to safeguard their competitive ability by goal-oriented B2B (international) cooperation. Communicative excellence will therefore become paramount. With this in mind, a new core company competence becomes apparent: the ability to form a real assessment of one’s own power and operating capabilities in order to build win-win relationships with other companies. Who’s my “PAL”? With whom are you going to pool, ally and link and co-create? 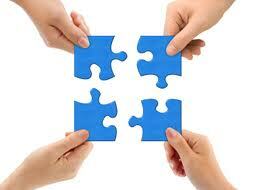 Examples of companies that have found their PALs are: Cisco, Philips & Sara Lee and Philips, AOL & Smit International. An example of a new combination is Shell, which now provides 500 greenhouse growers in the Westland area with 95 million m3 of carbon dioxide every year: a fantastic combination where there are only winners! Furthermore, how about the arrangement between Phillips and INHOLLAND University, in which students are contracted to write user manuals, promoting the “simplicity” so prided by the Philips brand? Or perhaps the linkage of e-Bay and Skype, a typical example of customer-pooling and shared puposes? Consequently, it is to be expected that the (international) outsourcing market will continue to boom and broaden in years to come, and not only in terms of the outsourcing classics of HRM, IT and financial administration: soon, sales and marketing will belong in this list. The increasing importance of collaboration between companies has a direct impact on marketing, and the establishment of a winning reputation is becoming even more important. People like to bet on winning horses. The Internet now therefore does not only force an objective assessment of market power of the company: the creation, both C2B and B2B marketing-oriented, of a thoroughly subjective winner’s image, in addition to a neat and tidy digital “front yard”, are further access requirements to successful business communities. So the Internet has made branding and association with success even more important to the modern company. Now, to say something about the effects of the Internet on the internal setup of a company. Data processing mechanisms within companies and among companies will begin to resemble each other more and more. B2B on the market, for instance through collaborative commerce, and collaboration within a company’s distributed team working on its own Intranet will have the same objective, namely to realize the necessary decrease, caused by the Internet, of coordination and transaction costs. E.g www.salesforce.com. The Internet makes relevant the view of Galbraith, the famous American economist, that companies are essentially units for processing data. In his terms, separate from the internal hierarchy of a company, intranets, extranets and the Internet have emerged as solutions for data processing and labour coordination. Hierarchy therefore has acquired a competitor in the coordination game in the form of the Intranet. Internal coordination arrangements, based on the structure of the organization, and formal job and process descriptions are able gradually to be replaced by external links, communities and portals. This means that within the structure of management a new optimisation issue has been added: where should which information processing mechanism be implemented? Where is a hierarchical and one-way “command and control” management sufficient, and where would all ways “multi-way” organic communication be more appropriate? The heyday of the “one size fits all” approach to set-up, staffing and tool provision is over: it is now more important to choose the information processing principle and process management structure that fits the nature of the business. Hierarchy and the hierarchic organization as a control solution belongs to strongly control- and stability-oriented fields in which stability and safeguarding are essential (e.g. the judiciary); the rapidly changing environments of many of today’s companies more often require a more fluid, network-oriented approach. As can be seen from the above diagram, business activity can be categorised into four distinct fields. Differentiating and simultaneously preserving the connection between these domains, particularly within the profile of IT and HRM solutions, will become one of the core assignments of company leadership in the next three years. Business administrators must come to know that while organisation in accordance with fixed routines (the “one-way” approach) often works very well, it is best suited only for tasks that lend themselves to such a thing. Conversely, structures that make room only for “multi-way” networking capabilities are also one-sided, since for many good reasons operational procedures are often best organized in accordance with a more autocratic style of leadership. This poses the challenge for human resource managers that command structures in some parts of a business will inevitably have to be focussed on stability, while in others the capacity to manoeuvre will be more important. As part of this task, a detailed individual match on the characters and competences of employees will have to be made to determine who fits where within an organisation. In the words of Peter Robinson (www.robertsconsulting.com), some people are more “matter-attached” and feel more at home in the stable world of rules and clear structures, while others are more “people-attached” and best oriented towards innovation and flexibility. An approach along the lines of “spiral dynamics” will probably have a great future. This HRM model enables the management of teams according to the diverse range of skills and qualities possessed by each individual, and can be operated from a set of web-based tools. Among their target markets and customers, companies are already familiar with differentiating according to varied factors and qualities: the trick will now be for them to also differentiate on the internal playing field with their own employees as well. Likewise, a major challenge for companies will continue to be ensuring that diverse market players will remain able to see the additional value to be had from each other and keep searching for cooperation. Consequently, the Internet will have a huge impact on the world of HRM. A standing example of a win-win situation between “one-way” and “multi-way” is the world of magazines. For many years, the “heartbeat” physically determinate logistical process, which allows your magazine to be delivered to your letterbox on time (“one-way”), has been linked, for mutual benefit, to the creative, information-controlled process of the journalist (“multi-way”). The creative journalist has a direct interest in the timely delivery of the magazine: a real win-win. An example where a mismatch occurs is in the relationship between the police and the structure of organised crime networks. No matter how the hierarchical design of a police “organization chart” might be restructured or further direct legislation passed to reinforce control, the police and the law are unable to reposition themselves according to their own structures to follow the rapid movements of criminal networks. Here, the consequences of a “one size fits all” approach to control structures has a high price. Therefore, the conclusion can be that the judiciary and police, along with the many other profit and nonprofit organizations that follow the same singular approach, must begin to adapt to address shifting and opposing circumstances. ERP suppliers and ICT trend-watchers predict that because of changing business opportunities and the necessity of improving performance, the “one-way” quadrant will grow at the expense of the “multi-way” quadrant. Of course, these parties have a good reason for this: it increases their market. Their analysis goes that software remains the best instrument to deal with business complexity. Isn’t the opposite far more likely? Won’t solving complexity become human work again? “One-way” organizations exist because of the requirements of control and will continue to do so while this capability remains necessary, while others will largely become “multi-way”, networked organizations. Usually, this is most easily implemented with the use of data-controlled processes (and there are applicable in very many places!). 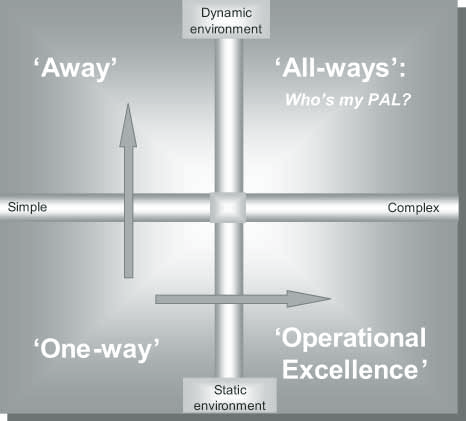 So, the all ways “multi-way” quadrant will grow at the expense of the “one-way”, and the reason for this is simple: ERP compartmentalizes and discourages a company. The first four concrete business courses where the business process had been organized on “reality-pull” and related “chain reversal” systems supplied savings of 40% on the back office. Another observation: management teams of large corporations do not only find themselves facing the challenge to improve their internally-oriented traditional control away from the “one-way” in the pursuit of operational excellence. At the same time the new “internet control”, forced by the market, must be implemented. This means that at the same time control must be both reinforced and relaxed: “schedule push” can be left behind and markets can be connected to by means of “reality pull”. In my opinion, this challenge is unprecedented from a management point of view. Consequently, many companies struggle with this issue: how do you achieve synergy between the reinforcement of the supply-controlled internal structure and collaborations (B2B), and the demand-controlled chains (C2B)? The company which is able to really achieve the synergy of stable, efficient, supply-controlled cERP and dynamic, effective, demand-controlled CRM will be able to combine economies of scale and scope to really communicate effectively, ultimately winning the customer. From a psychological perspective, as long as you are in the “command and control” mode towards others or only for yourself (and that goes for many of us Westerners! ), it is almost impossible to listen. This goes for individuals, and also applies to companies. For you, as a company, this makes it especially necessary to find a place in a winning B2B business community and to find your “PAL”: to “encounter”, you must stop “countering”. This is the big business transformation that lies ahead. The trick will become to keep the worlds of “one-way” and “multi-way”, with their differing rhythms and characters, connected within companies and between companies. Company leadership should create respect between businesses with genuine focus as real PALs on the road to victory. Communicating effectively with customers has been essential for a long time: now, added to this, we have the importance of communicating with other companies. The real Business Process Re-engineering starts now! « Am Anfang steht die Farbtube……..oder was haben Glück, Weisheit, Twitter und Serendipitӓt mit Innovation zu tun? core competence (2004) | Frans van der Reep <Loved it!